I really enjoyed staying at Acropole Sunrise. Estamatis was very hospitable, friendly, and extremely helpful - especially in helping me with my delayed luggage at the airport! The views from the hotel were breathtaking and the rooms were clean and comfortable. I would definitely stay here next time I visit. Stamatis is very nice. He helper us with the transfer from and to the airport, he gave us tips and tricks about the island, restaurants, what to visit, local transportation and much more. What's more, the landscape is beautiful. You can get up early to see the sunrise. It take only 5-10 minutes. The visitors are not so many like the Oia so it is quiet. The staff was very friendly. Good atmosphere in the hotel. Loved the view from the hotel, a bit outside the center of Kamari, but we liked it more quiet. Good breakfast. The hotel and host(Stamatios) exceeded my expectations. 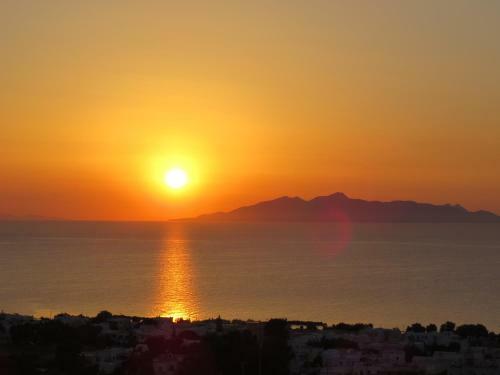 The hotel has the best views on the island, with every room having a balcony and a view that will take your breath away! He cooked the breakfast every morning, with local cuisine that changed day by day. He was incredibly helpful and accommodating, even going so far as to give us a much needed ride(after a long day of walking, in the sun) in his personal automobile. He provides full concierge service, with great advice on what to do, where to go, and where to eat. He is the reason we will return to Santorini!!! We love that guy!!! Everything was as described. The owner is very kind and careful. He can give good advice for the attractions of the island. The room is beautiful and clean. They have every detail organized in order to the customers feel very good. The view is fabulous. We will definitely come back. Clean rooms, comfortable bed, quiet & serene location (located on top of a steep slope, recommended to have a car). The host was extremely friendly and helpful. Staff here are lovely too. I loved the hospitality and the view from the room. I was looking for somewhere that's centrally located while away from the crowd with an amazing view, and I found it! Petro and his wife are really lovely and I felt very at home staying with them. The breakfast everyday was a bonus. Great value for money for a trip to Santorini! The sunrise is something worth getting up to see! It’s location relative to the beach (Kamari). A great view of the whole Kamari as the property sits on top of a hill. The host and his staff are in incredibly accommodating! Lock in a great price for Acropole Sunrise – rated 9 by recent guests! One of our best sellers in Kamari! Offering panoramic views of the sea and nearby Fira, Acropole Sunrise Hotel is on a small hill a 15-minute walk from the pebbled beach of Kamari. All rooms have balconies with sea, sunrise or sunset views. The air-conditioned rooms are bright and sunny and each offers a fridge and private bathroom. Continental breakfast is served daily, and guests can enjoy it in the privacy of their room or in the breakfast room. Snacks and light meals can also be prepared upon request. Free WiFi is available in public areas, while guests can also use a common PC. The Acropole offers ticket and concierge services. Laundry service is available on request. Free public parking is available close to the hotel. Less than 5 minutes’ walk will take you to the center of Kamari and the nearest bus stop. The beach of Kamari is well-equipped, featuring sun chairs, umbrellas and a variety of water sports. The airport is 2.5 mi away, while island's capital, Fira Town, is at a distance of 4.3 mi. 뀐 Located in the top-rated area in Kamari, this property has an excellent location score of 8.9! 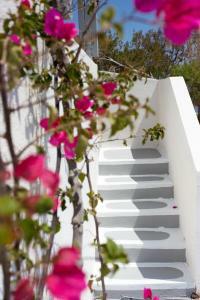 When would you like to stay at Acropole Sunrise? Decorated with light colors and tasteful wooden furniture, this room opens to a private balcony with sea views, and includes air conditioning and a fridge. This double room features a balcony, soundproofing and patio. My name is Stamatis and i will be next to you for any help!!! Kamari is one of famous black beaches of the Island. Acropole is one place that you will love it with panoramic view to enjoy your time here. House Rules Acropole Sunrise takes special requests – add in the next step! Acropole Sunrise accepts these cards and reserves the right to temporarily hold an amount prior to arrival. Kindly note that to access the hotel, there is a steep climb on foot of 350 feet. Please inform Acropole Sunrise of your expected arrival time in advance. You can use the Special Requests box when booking, or contact the property directly using the contact details in your confirmation. I think Santorini is good, but Acropole Sunrise is the best. There was nothing that was unpleasant about my stay. Everything. The room was clean and very comfortable. The owner, great person, helpful and very polite. The area is amazing,full of restaurants and beaches. 3 minute of walk up hill. Our stay at Acropole Sunrise was amazing! Stamatis is the nicest person you can imagine, who offered us a warm and homely welcome and was very helpful in offering us information on the island. The view from the balcony is absolutely amazing and the black beach is just a max. Of 10min away. We highly recommend it! Nothing, we really had a very good time there. The hotel is very nice and cosy, like a homelike place. Rooms and shared areas are clean. Very nice breakfast. The hotel is located 10 minutes by walk from Kamari beach, which is quite convinent if you are planning to enjoy the beatiful summer weather in Santorini. Stamatis, the host, was genuinely warm and helpful. He provided many useful information for having an amazing staying and visiting the island. He was very kind and attentive, he even provided breakfast and a shower out of our booking time, which we really appreciated. Overall, the host has a very nice talking approach which make you feel very confortable. We really enjoyed our staying there, thanks for everything Stamatis. amazing sunrise every day, very nice host he suggested us amazing tours and very useful information. The showers could be improved incl. the heating of the water. Also that there wasn't any pool. The airconditioning unit outside our room on the terrace was leaking water, making the floor rather wet. Minor improvements could be made overall. The location, breakfast-menu and the staff, overall super pleasant and trouble-free stay. Staff; Stamatis(Front of house) is one of the most genuine people on this earth, he really has a heart of gold and deserves all the praise he gets in these reviews. He provided the much needed help and navigation throughout the Island incl. tours, popular places to have a really good meal & dessert, transport etc. For the people who are looking to book at Acropole Sunrise: Remember that the basket at the entrance of the reception is for the guests and can be used. They contain sunscreen, oils, shampoos etc if you need it. Also don't forget to leave a note at the end of your stay in the small booklet you'll find at the entrance as well. Location; The hotel is placed rather high up on the side of a hill, so the view over the most of the island is proper eye-candy. (You get used to the hike up the winding road after a day or two, but people that have trouble walking will need to take a taxi or rent a form of transportation. Breakfast; Every morning from 8.30 till 10.30, there is a wide selection of what you would expect from a traditional breakfast brunch, incl. coffee and cake. Really good indeed. Room; Room was cleaned daily as expected, air-conditioning worked flawlessly, decent facilities with a fridge and outdoor walking/chilling area just outside the room. stamatis was an incredible host. The hotel is very romantic with al lot of charm. I definitely would recommend you to stay here. The wifi is not so quickly. The breakfast is not very equilibrated. There is a lot of carbohydrates (jam, nutella, bread) and almost no protein(only one egg and some cheese, meat and yogurt from time to time).